The first time I had Vietnamese Shaking Beef or Bo Luc Lac was in Mui Ne, Vietnam, a beach resort town outside of Saigon/Ho Chi Minh city. We were close to our resort when we pulled over to a random beach-front restaurant to freshen up and fill our bellies. In the beautiful country of Vietnam and in the city of seafood galore, I ordered a hamburger. You live and learn. Luckily, my husband ordered Shaking Beef and naively offered me a bite. 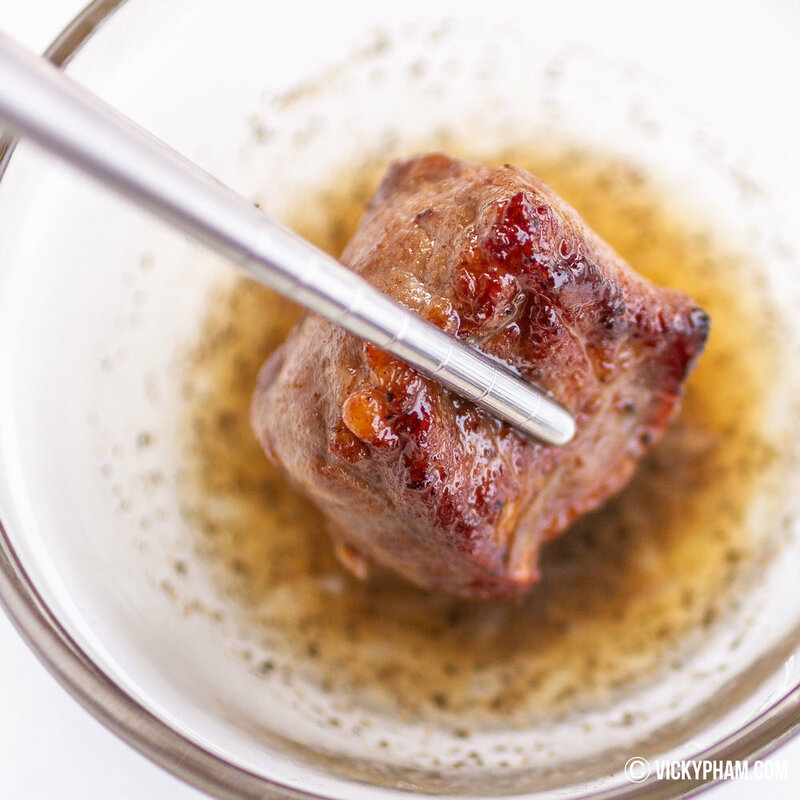 After one bite of this flavorful Vietnamese dish of seared beef cubes, I tossed my hamburger aside. I slid his plate over to me and finished his food like a stealth ninja. Vietnamese Shaking Beef (Bo Luc Lac) dipped in a lime-salt-pepper sauce. Bo Luc Lac is not a common home-cooked dish. It's more of a celebratory dish that is eaten as an appetizer. However, nowadays, you now can find Bo Luc Lac served with rice in many Vietnamese restaurants. When making this dish, use a good quality steak. High-end restaurants opt for the fancy cuts such as filet mignon for a tender and juicy steak. I make mine with less expensive cuts like sirloins or tri tips. You may have to chew a little more, but the flavor is all the same. Like all good steaks, do not overcook it! Medium rare is the way to go. Anything over that is blasphemy. 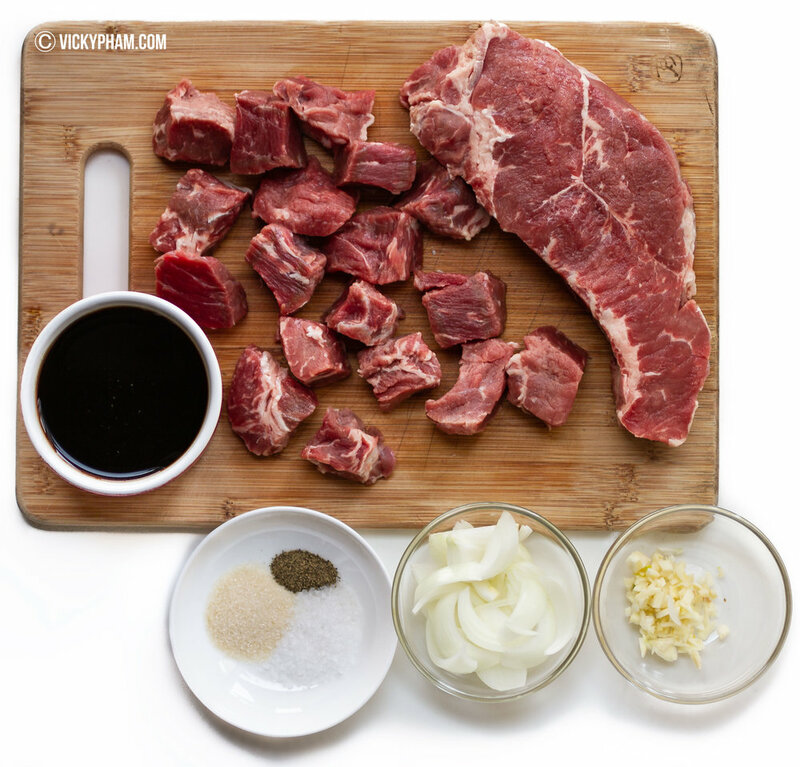 In large bowl, marinate beef with sugar, salt, black pepper, and minced garlic for at least one hour at room temperature or overnight in fridge for best results. 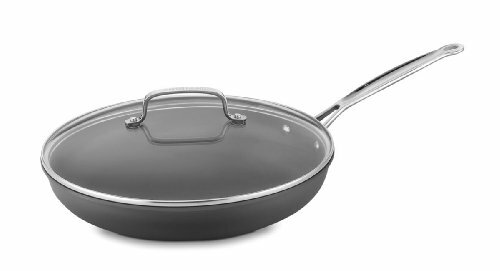 In a large skillet, heat up vegetable oil on medium high. Add half of the beef cubes and sear on all sides by shaking beef until medium rare. No more than 2-3 minutes total. Transfer to a bowl and repeat with other half. To the now empty skillet, add butter. Once melted, add onions and garlic. Sautee until fragrant (about 1-2 minutes). Add soy sauce, fish sauce, honey, rice vinegar and sugar. Cook the mixture for about 2-3 minutes. Toss in seared beef cubes until nicely coated. Transfer beef and sauce onto a bed of lettuce, watercress, tomatoes, and/or cucumbers. Mix together the lime juice, salt and pepper. Serve shaking beef with rice, and lime dipping sauce on the side.